Consider buying a pair of Yaktrax to add traction to your good, winter footwear (the Yaktrax “Walk” style is available for close to $20). These rubber slip-ons are easy to apply to any shoe or boot, and they have metal coils that grip the sidewalk and improve traction. I (Lonnie Stewart) use them when the weather is cold and icy. Don’t wear them around the apartment – they’ll ruin your floors. Purchase direct from Yaktrax (https://yaktrax.implus.com/product/yaktrax-walk-ice-shoes) or find them on Amazon. Your building may want you to put them on and off in the building foyer to limit any damage to common area floors. (Disclosure: I am not paid by Yaktrax, I just like their product, and so does my 87-year-old mother!). Watch the path ahead. Don’t get too distracted by conversation: look at the path ahead of you so you can be prepared. Often, if sidewalks have not been cleared, the well-worn path can be more treacherous than the snowy path around it. If the well-worn path is slippery, test out the borders of the path which may have more of a grip. 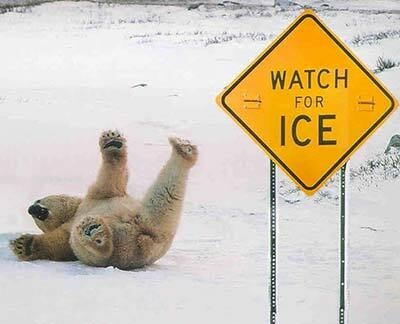 Take smaller steps on slippery surfaces and take your time. Don’t try to suddenly speed up or slow down. Keep a steady pace with small strides, keeping your body weight over your feet. If someone tries to help you (or if you ask for help), YOU take a hold of THEIR elbow or forearm so that you have control over your own movements. A person who tries to control you or lift you from your arm or under your shoulder makes the situation less safe. You both could end up on the ground. Keep your hands out of your pockets for better balance. That means you need gloves or mittens. Having your hands free significantly helps with balance and coordination. Keep knees slightly bent. This keeps your leg muscles engaged and ready for action. Prepare to fall! What on earth did I just say? Yes, prepare to fall. This means thinking of rolling with the fall. Instead of falling directly forward with your arms outstretched (a common protective reaction, but a common way to break your wrist or forearm): tuck your chin, turn your body away from the ground, roll onto your side and back. I cannot guarantee you will not hurt yourself, but you will possibly limit the damage as more of your body’s surface area takes the impact of the fall. Tucking your chin protects your head from hitting the ground. If you are falling backward: sit down in addition to tucking your chin. The goal is to get your center of gravity low as soon as possible by bending your knees, instead of a full-body flop backward. Again, tucking your chin helps to avoid your head hitting the ground. Toss the load you are carrying. If you begin to fall, save yourself, not your groceries. Also, try to carry lighter loads and carry equal loads in each hand to keep weight even as you walk. If you fall and hit your head, don’t mess around: call 911 and be seen by a physician ASAP. Please: don’t assume you are going to be okay. If you happen to be taking a blood-thinning medication and you hit your head, you must go to the hospital without question. Yes, it is a pain in the you-know-what, but go to the hospital and make sure your head is okay. A bleed from the brain must be identified and treated immediately. If you wait for symptoms to appear, you have waited too long. On another note: if you fall and are unable to put weight on your leg, go to the hospital or urgent care center to get an x-ray. Use handrails when they are provided! Finally: Order out or phone a friend! So many services can be brought to you during the worst of cold days. Most cleaners will pick up laundry, most grocery stores deliver, and ordering out meals is an NYC time-honored tradition. As an N2N participant – don’t be afraid to call on a friend or check-in with each other. Friendships make the cold weather warmer. This is not an exhaustive list, but I hope this information helps. Feel free to leave comments (which are moderated by N2N). I am happy to reply questions, comments, and suggestions.